Boobs4Food was built on many thoughts, moments, meals – all of which have been inspiration to us being Boobs4Food. In our world, food is synonymous with love. Food is how we primarily express our affection, our compassion and our passion. We not only love to eat, but we also get around to reading quite a bit and we are lovers of knowledge between the covers…the hardcovers. 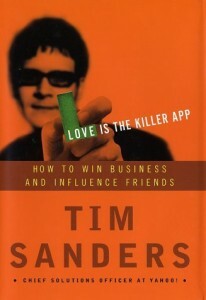 We love subjects that are meaningful and one particular book has truly inspired us: Tim Sanders’ Love Is The Killer App. My best friend Melissa let me borrow the book a few years back and needless to say, I can’t even remember if I ever returned it to her. I can’t even remember if I returned it to her mostly because I have since purchased multiple copies to give out to strangers, clients and friends I feel could benefit from the brilliance of former Chief Solutions Officer at Yahoo! and NY Times’ bestselling author Tim Sanders’ book. Love Is The Killer App has served as a true inspiration and motivator behind the existence of Boobs4Food given its message that to succeed in business or life, one has to share their knowledge, their network of relationships and their compassion – or any mix of the three. Love Is the Killer App starts with the definition of love from Milton Mayeroff’s book “On Caring” — “Love is the selfless promotion of the growth of another” — and then applies this definition to business — “the act of intelligently and sensibly sharing your intangibles [your knowledge, network and compassion] with your bizpartners”. Reading these definitions alone hit me to the bone on what it means to be of value and an asset to those around me and how we’ve established Boobs4Food to do the same – to intelligently and sensibly, with moderation, share our knowledge, network, compassion and even passion with all that are interested. Whether we’re sharing what’s great to eat, what organization to donate our time to, what restaurants to visits or suggestions on anything – this is how we see and live love. As we continue organizing events which support local, domestic and international hunger-related causes, we look to bring together friends, strangers, food enthusiasts and colleagues to absorb each others networks and strength – in hopes or bringing more awareness to causes we care about and stirring up more passion for various purposes that give all of our lives more meaning – both individually and as a community. Love is indeed, our killer app and this entry won’t be the last of inpiration driven by Tim Sanders. Please check the book out!